Wood turtle is a turtle native to North America. It is named so because of its pyramidal shaped sculpture on its scutes. 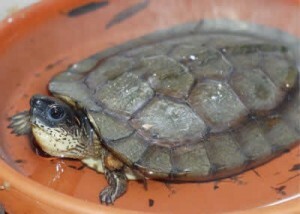 It belongs to the family Glyptemys and has only one other family member, the bog turtle. The wood turtle is named so because of the sculpted appearance of its carapace. It has a grayish brown carapace which is rough and has a pyramidal pattern. It grows to a length of about 14 to 20cms. A fully grown adult wood turtle weight around a kilo. Wood turtle do not shed their scutes like the other turtles. The age of the wood turtle can be figured out by counting the rings like that of a tree stump. Thus a juvenile wood turtle are not sculptured. However with age, the scutes wear down by being dragged in the gravel or sand, therefore, even the most aged wood turtle may have smooth scutes. The hatchlings have a grey carapace but tan as they grow. An adult wood turtle has a rich brown carapace. A mature male is larger than the female. Male reaches a length of about 23.4cms and female reaches maximum length of about 20.4cms. The male wood turtle has a larger head with longer tail and more doom-shaped carapace. The neck, chin and the leg of a female is yellowish however the male has darker shades. The upper surface of its head is solid grey or black and at times spotted yellow. 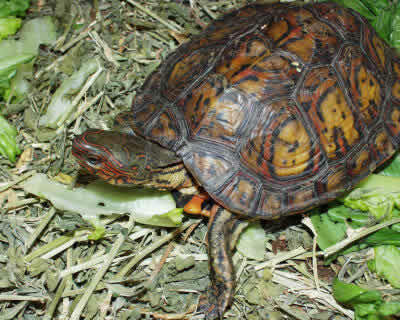 Wood turtles prefer both aquatic and terrestrial habitation. They require a small to medium fast moving streams and mostly mate, feed and hibernate inside the water but require terrestrial habitat for laying eggs. They live adjacent to coniferous and deciduous forest or lowland forest. They have the sand and gravel substrate hence lives very close to the stream. It is proved that the wood turtles carefully choose their province than to settle randomly. Spring is a basking period for the wood turtles. They are mostly seen under the vegetation or the debris and are the foraging period for them. They are seen resting in the terrestrial grounds during summer. They stay under water during the winter months. Wood turtle hibernate alone or in groups by burying themselves inside thick mud under water. They hibernate from November till mid march and emerge only after March or April at times. The male turtles are very aggressive. The submissive turtles are tortured with physical abuses by biting or forcing them to flee. At times, the wood turtles stump the ground with its forefeet like imitating the sound of a rainfall so that the worms would come out and become an easy prey. While searching for prey in and outside water, they poke their head in the decayed logs and vegetation. The sexual maturity of the wood turtle varies according to the area. Their breeding season peaks in spring and fall. Usually there is more than one male fighting for a female and the dominant one mates the female. The mating behavior of the wood turtles is amusing. The male approaches the female and if the female agrees, they face each other and sway their head sideways simultaneously. This behavior goes on for sometime until the male mounts on the female. During the copulation the male often bites the head and shell of the female. The mating ritual of the wood turtles may last for almost 5 days, however, the copulation last for only an hour or two. The nesting season starts from May to early June. The female digs her nest in a well drained moist area with adequate sunlight. Female lays around 4 to 17 eggs during June, they hatch by September. Wood turtle live up to 40 years in the wild and almost 58 years in captivity. Wood turtle can travel at a good speed during its active months. They are intelligent animal with locating abilities. Wood turtle hibernates during winter, from November to March. They bury themselves inside deep mud under water. They hibernate alone or in a group and emerge only in March or April. Wood turtles are Omnivores. They are facultative omnivores hence prefer animal over plant any day. Wild wood turtles feed on earthworms, leeches, snails, larvae, tadpole, frogs, and eggs of certain birds, newborn mice, crayfish, moths, millipedes, beetles and various other insects. They feed on grasses and algae, leaves of birch tree, willow and cranberry leaves. They relish the flowering plants like dandelions, wild violets, cinquefoil, toxic milkweed, mullein, greenbrier, plantain etc. The adult wood turtle often fall prey to the raccoons. 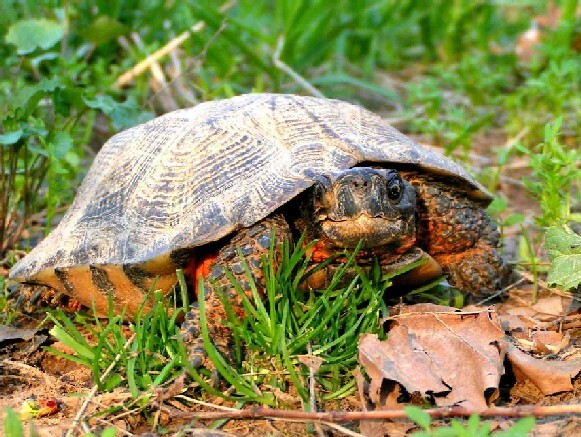 The eggs and the juvenile wood turtles are attacked by several predators like coyotes, ravens, skunks, dogs, cats, chipmunks, raccoons, several birds, snapping turtles, beavers, foxes and porcupines. Housing: Wood turtles live on land and water, therefore, approximately 2 feet deep water along with a dry land should be provided for them. The enclosure should be housed outside for adults but the juvenile can be kept indoors but ultimately needs to be shifted too. Temperature: a temperature gradient of 70 to 80 degree F would be required. The water inside the closure should be a little cooler. Diet: In captivity the wood turtles can be feed on fruits like apple, apricot, grapes, cherries, bananas, strawberries, raspberries, pears etc. vegetables like carrots, lettuce, spinach and corn can be fed. Canned dog food, chicken heart and liver, hard boiled eggs, dead mice, adult crickets and earthworm can be fed to the pet wood turtle. Wood turtle were once abundant but is now considered as one of the threatened species. The population of the wood turtle has decreased due to loss of habitat, illegal collecting for pet trade and road kill mortality. Destruction and degradation of their habitat by water pollution, irrigation, forest erosion etc has affected the population on a large scale. Wood turtle is a late maturing species, therefore, even if a single turtle is affected, it would hamper the generation to come. 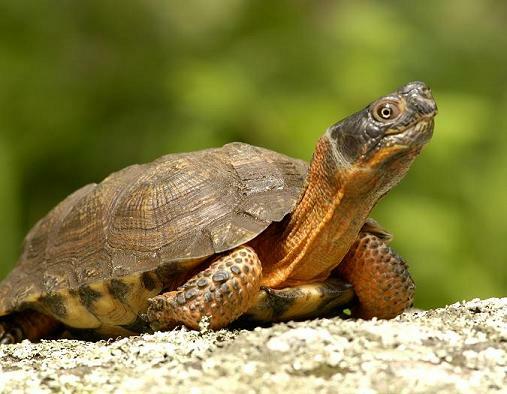 Survey of the wood turtle habitat is needed. Under-road channels for preventing road accidents of the turtle while crossing the road and proper awareness to avoid keeping wood turtle as pets are some of the measures to conserve the species. Here are some of the pictures of the Wood Turtle.